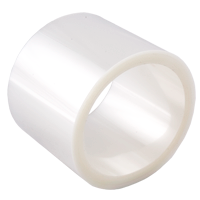 OCA film 10m x 10cm roll - 250um it's 10 meters long special type of Optically Clear Adhesives tape (called OCA) that is used for bonding glass (digitizer) with display by heating under pressure of these elements in autoclave. Offered by us tape is 10 meter lenght, 10 cm width and 250 micrometers thickness (depends on your choice) and allows customer to cut at own for desired size. 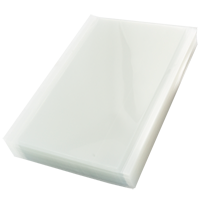 Universal OCA adhesive 143x100mm sheet is adhesive for bonding glass (digitizer) with display by heating under pressure of these elements in autoclave, resulting in is removal of air bubbles and melting and curing the adhesive OCA. 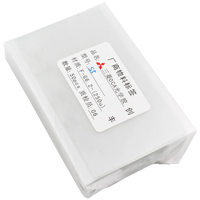 OCA Mitsubishi adhesive for iPhone 4/4S 250um is original Mitsubishi Optical Clear Adhesive for iPhone 4/4S 250uM used in LCD repairs. 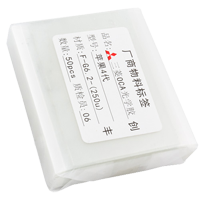 OCA Mitsubishi adhesive for iPhone 5/5S 250um is original Mitsubishi Optical Clear Adhesive for iPhone 5/5S 250uM used in LCD repairs. 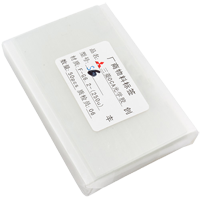 OCA Mitsubishi adhesive for iPhone 6 250um is original Mitsubishi Optical Clear Adhesive for iPhone 6 250uM used in LCD repairs. 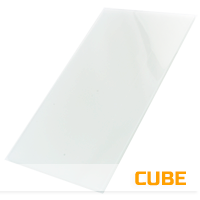 OCA adhesive sheet MyPhone Cube 5"
OCA adhesive sheet MyPhone Cube 5" is adhesive for bonding glass (digitizer) with display by heating under pressure of these elements in autoclave, resulting in is removal of air bubbles and melting and curing the adhesive OCA. 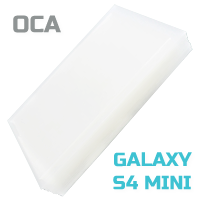 OCA adhesive sheet (200/250 µm) for Galaxy S4 Mini (I9190/I9195) 4,3"
OCA adhesive sheet (200/250 µm) for Galaxy S4 Mini (I9190/I9195) 4,3" is adhesive for bonding glass (digitizer) with display by heating under pressure of these elements in autoclave, resulting in is removal of air bubbles and melting and curing the adhesive OCA. 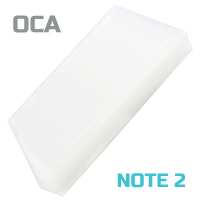 OCA adhesive sheet (200/250 µm) for Note 2 (N7100) 5,5"
OCA adhesive sheet (200/250 µm) for Note 2 (N7100) 5,5" is adhesive for bonding glass (digitizer) with display by heating under pressure of these elements in autoclave, resulting in is removal of air bubbles and melting and curing the adhesive OCA. OCA adhesive sheet (200/250 µm) for Sony Xperia Z (C6603, C6602) 5"
OCA adhesive sheet (200/250 µm) for Sony Xperia Z (C6603, C6602) 5" is adhesive for bonding glass (digitizer) with display by heating under pressure of these elements in autoclave, resulting in is removal of air bubbles and melting and curing the adhesive OCA. 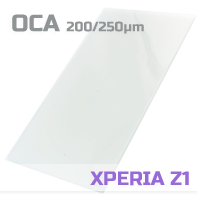 OCA adhesive sheet (200/250 µm) for Sony Xperia Z1 (C6903, C6943) 5"
OCA adhesive sheet (200/250 µm) for Sony Xperia Z1 (C6903, C6943) 5" is adhesive for bonding glass (digitizer) with display by heating under pressure of these elements in autoclave, resulting in is removal of air bubbles and melting and curing the adhesive OCA. 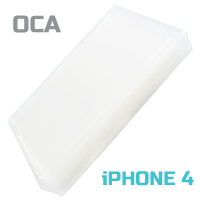 OCA adhesive sheet for iPhone 4 3,5"
OCA adhesive sheet for iPhone 4 3,5" is adhesive for bonding glass (digitizer) with display by heating under pressure of these elements in autoclave, resulting in is removal of air bubbles and melting and curing the adhesive OCA. 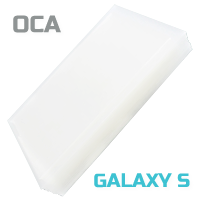 OCA adhesive sheet for Galaxy (I9100) 4,3"
OCA adhesive sheet for Galaxy (I9100) 4,3" is adhesive for bonding glass (digitizer) with display by heating under pressure of these elements in autoclave, resulting in is removal of air bubbles and melting and curing the adhesive OCA. 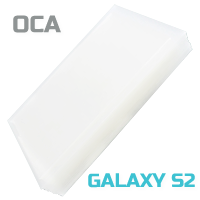 OCA adhesive sheet for Galaxy S (I9000) 4"
OCA adhesive sheet for Galaxy S (I9000) 4" is adhesive for bonding glass (digitizer) with display by heating under pressure of these elements in autoclave, resulting in is removal of air bubbles and melting and curing the adhesive OCA. OCA adhesive sheet for Galaxy S3 (I9300) 4,8"
OCA adhesive sheet for Galaxy S3 (I9300) 4,8" is adhesive for bonding glass (digitizer) with display by heating under pressure of these elements in autoclave, resulting in is removal of air bubbles and melting and curing the adhesive OCA. OCA adhesive sheet for Galaxy S3 Mini (I8190) 4"
OCA adhesive sheet for Galaxy S3 Mini (I8190) 4" is adhesive for bonding glass (digitizer) with display by heating under pressure of these elements in autoclave, resulting in is removal of air bubbles and melting and curing the adhesive OCA.